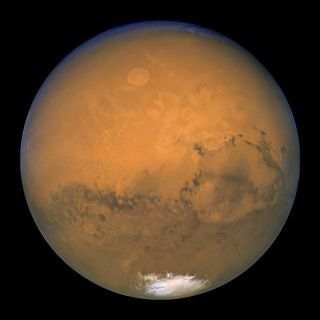 Mars, as seen by the Hubble Space Telescope in August 2003. Radiation exposure is among the top health risks for Mars astronauts, but the Red Planet poses many other dangers as well. The most immediate threat to human health on Mars is the low pressure of the planet's atmosphere, which is about 100 times thinner than Earth’s. "All the gases that are dissolved in your bloodstream [would] just turn into bubbles," he said during a webcast interview at the 2017 Humans to Mars Summit, which is underway this week in Washington, D.C.
"Like popping a can of Coke, you would fizz to death," Lee said. "And that's within seconds." Earth's atmosphere is about 78 percent nitrogen and 21 percent oxygen, with trace amounts of water vapor, carbon dioxide and other gases. By comparison, Mars' atmosphere is 95 percent carbon dioxide. "We need to breathe oxygen," said Lee. "There's no free oxygen in the Martian atmosphere. You cannot breathe this gas. You would die of hypoxia within minutes." During a summer day on Mars, the temperature at the equator can reach as high as 70 degrees Fahrenheit (21 degrees Celsius), but the nighttime temperatures are deadly. On average, the temperature plunges to about minus 80 degrees F (minus 62 degrees C). "This is something that would kill you over the course of hours if you are not properly warmed," Lee said. Mars is covered with toxic dust that is also finely grained and abrasive, and all of those traits are bad news for human lungs, Lee said. "You would die over the course of weeks if you were exposed to Martian dust," he said. The lack of a global magnetic field on Mars, coupled with the planet's thin atmosphere, means that high-energy cosmic rays and solar particles shower the Martian surface. "Space radiation is mellow in some places on Mars. We expect it to be higher where there is hydrogen near the ground," Lee said. "In any case, it is something that, over course of months, would end up killing you as well." The long-term goal of the U.S. space program is a human mission to Mars in the mid-2030s, NASA has said. The agency is currently developing more than three dozen technologies to ensure human health and support science goals for exploration beyond Earth orbit.